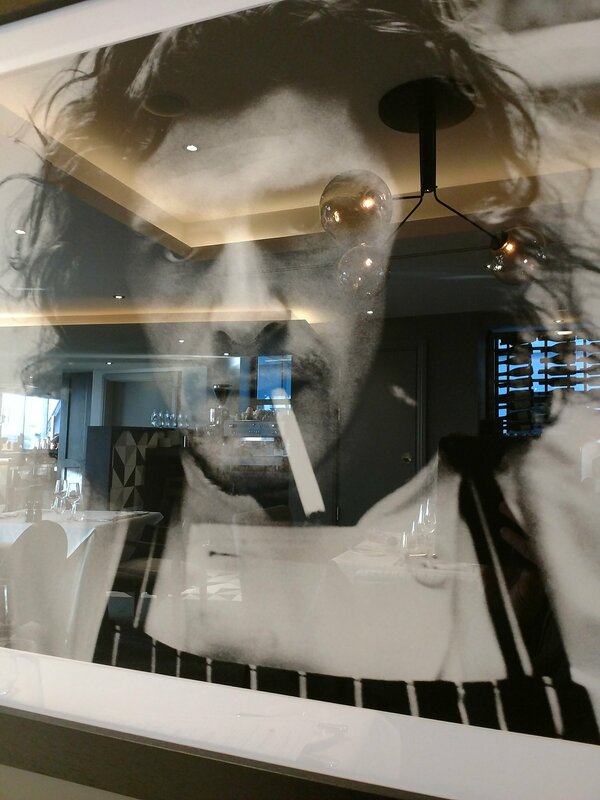 Marco Pierre White has been a food hero of mine since back in the late 80s and 90s when he was the enfant terrible of the culinary world. A genius in the kitchen, he garnered the chef’s holy grail of 3 Michelin stars (the first British chef to do so) at the tender age of 33 and then, in 1999, achieved food rock star status by deciding “bugger it all” and giving back his Michelin stars and retiring (with refreshing honesty as to why). He was renowned for being irascible to customers (a habit I suspect he learnt when working for the formidable Nico “ask for salt and the cellar will be inserted where the sun don’t shine sunshine” Ladenis who was one of the first crop of celebrity chefs featuring in the seminal “Take Six Cooks” TV series ), famously endulging a customer’s request for chips by hand cutting and frying them himself and charging said customer £25 (a hell of alot back then) for the privilege. Many have criticised him for selling out to the corporate blob, when he became a brand ambassador for Knorr (advertising their stock pots). My view is he has nothing left to prove in the kitchen so he can do what he likes to earn a crust (seriously disagree with his views on English wine mind – I am what Marco would regard as a numpty due to my appreciation of good English and Welsh wines – but his words on the subject elicited lots of publicity in favour of these wines which can only be a good thing). 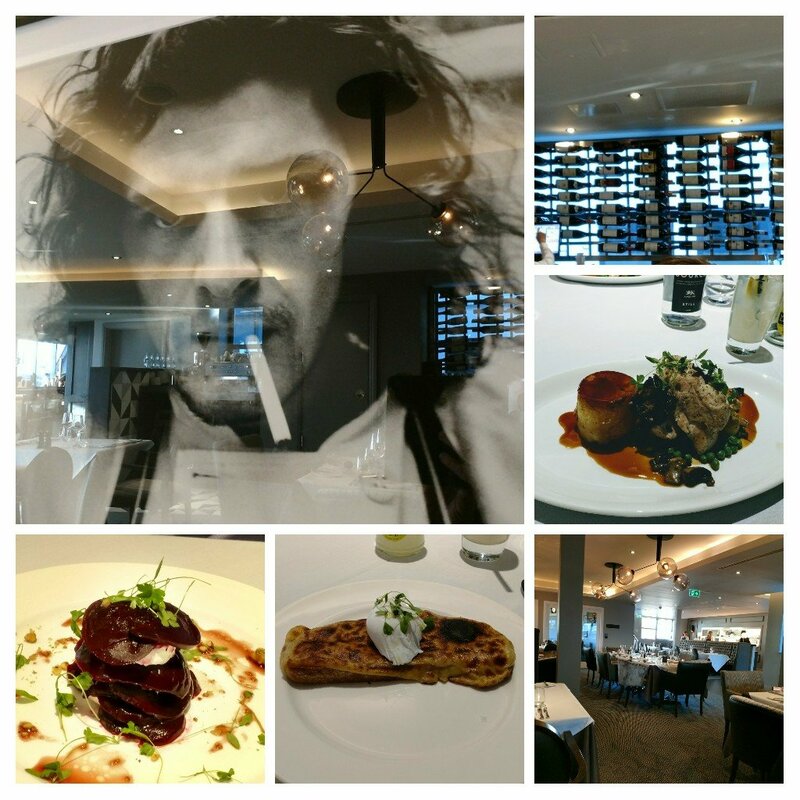 This brings me to the recently opened “Marco Pierre White – Steakhouse Bar & Grill” at the newly opened Hotel Indigo on Queen Street, an example of “brand MPW” rather than chef MPW. This is a place that, as far as I can tell, operates as a franchise as opposed to being an actual MPW restaurant so the link to MPW would appear somewhat tenuous and in reality in brand only. Doesn’t stop MPW’s face being slapped on pretty much everything. Got to get your monies worth, I suppose. This looked down on me as I ate! 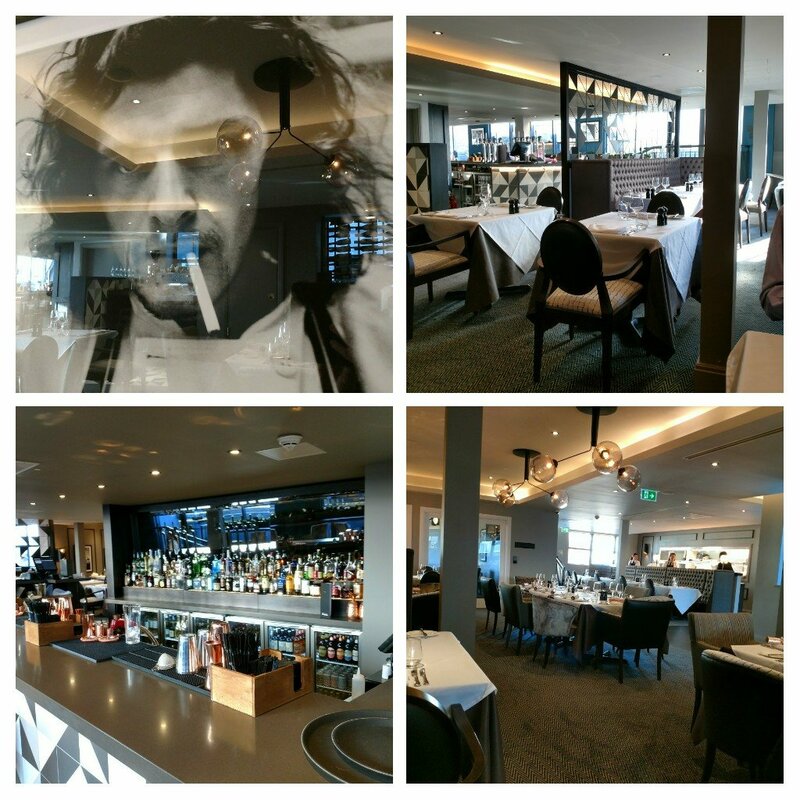 Looking at TripAdvisor (always good for a chuckle, with genuine, informed, opinion getting rarer and rarer), I noted one diner started with faux indignation that “whoever was in the kitchen it certainly wasn’t Marco Pierre White” or something similar. Amazingly they seemed to be surprised that the great one was not in attendance (wish he had been there to charge them £35 – with inflation – for their chips) rather than back home counting his money. Bet they were equally disappointed when they visited Jamie’s Italian (but then again who isn’t) to find the sanctimonious one wasn’t in attendance preaching from atop a box of sugary sodas (taken from the stock room) about the evils of said sodas (while the waiting staff plucked cans of it from his plinth to serve to the customers at outrageous mark ups). 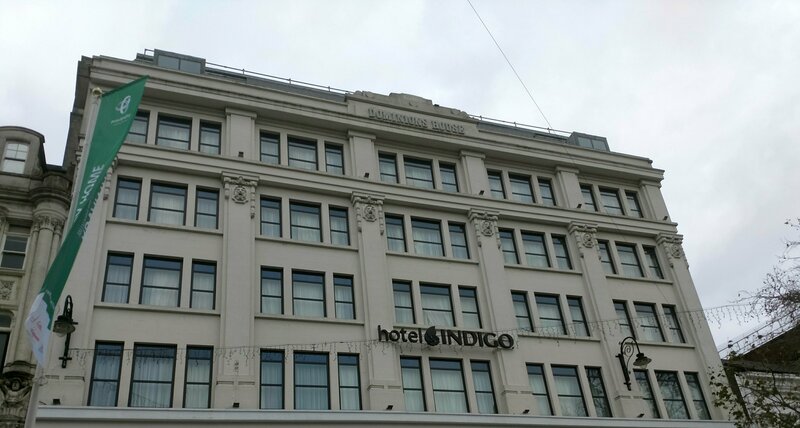 It is nice to see a building sympathetically brought back to life and the exterior of Hotel Indigo is very pleasant. 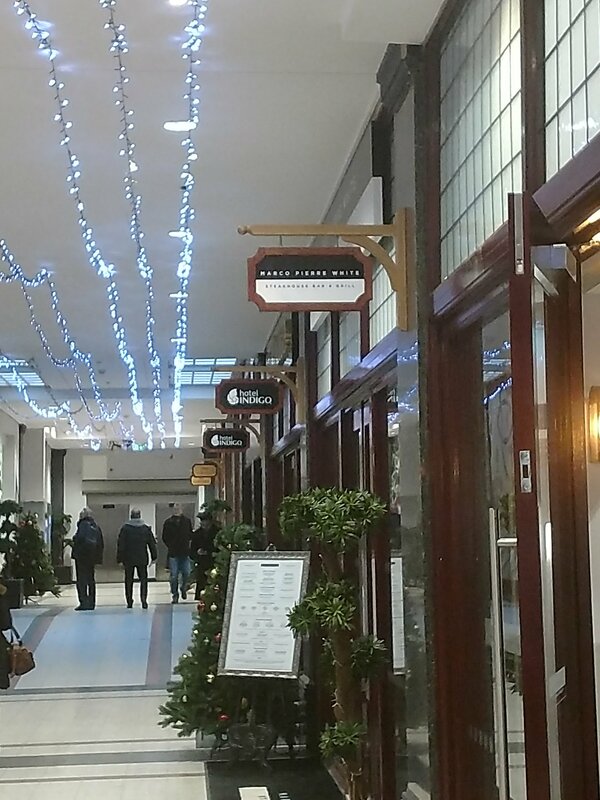 The restaurant is on the 6th floor and is a nice space with a relaxing bar area. It is well appointed – classy but not OTT. The main menu is a mix of classic British and French dishes. Some nice sounding stuff on it I thought. Certainly not cheap though, with nigh on £30 for a 8oz fillet (very boring cut of beef if you ask me and with no indication of provenance, which I would expect at that price). I was there (as is usual) for lunch rather than dinner, with a fixed price menu on offer. 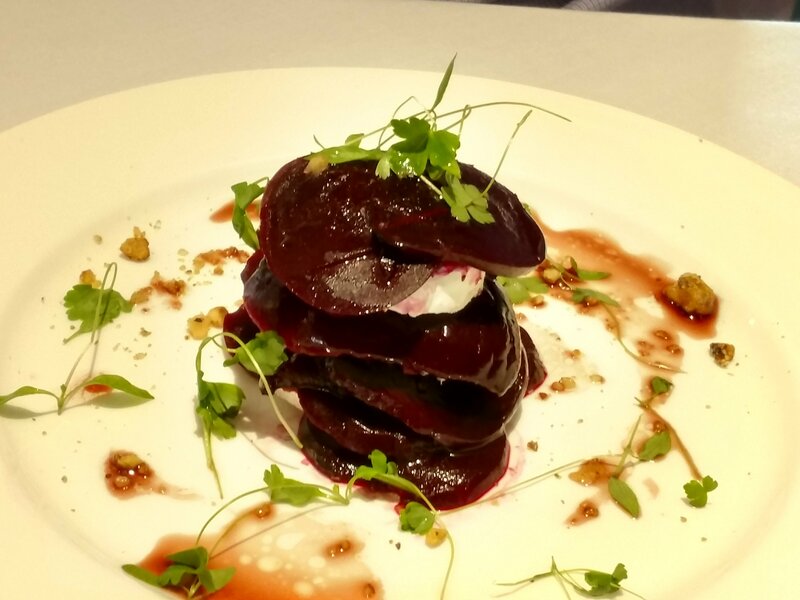 At £12.50 for 1 course and £17.50 for 2 courses, it is at the top end of what is on offer fixed price wise in Cardiff (see my post on what other places offer) at the moment. 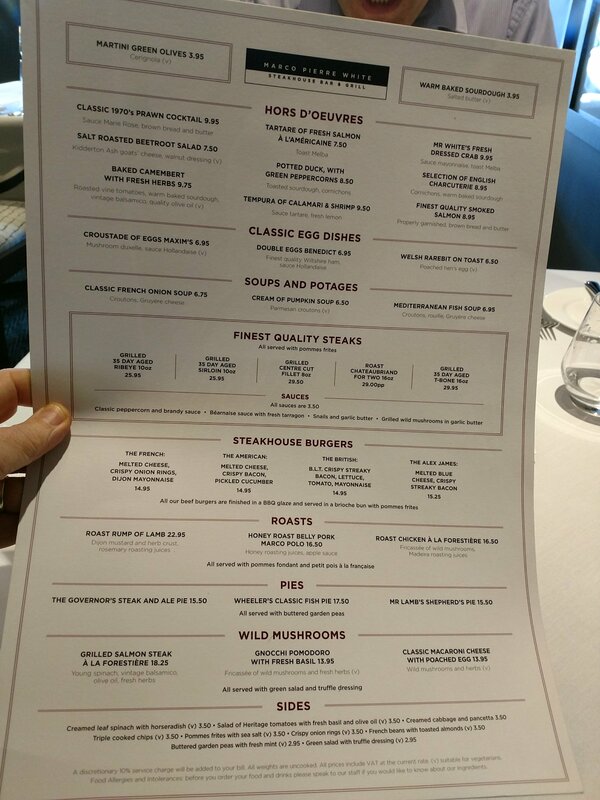 The menu features 4 starters (3 stated to be veggie – but I would dispute at least one as genuine parmesan cheese is always made with rennet so not veggie, not sure as to the cheese in the Welsh rarebit ) and 4 mains (only one veggie one of these). Not a bad selection for starters and, which gives at least pause for thought. Less so for the mains. 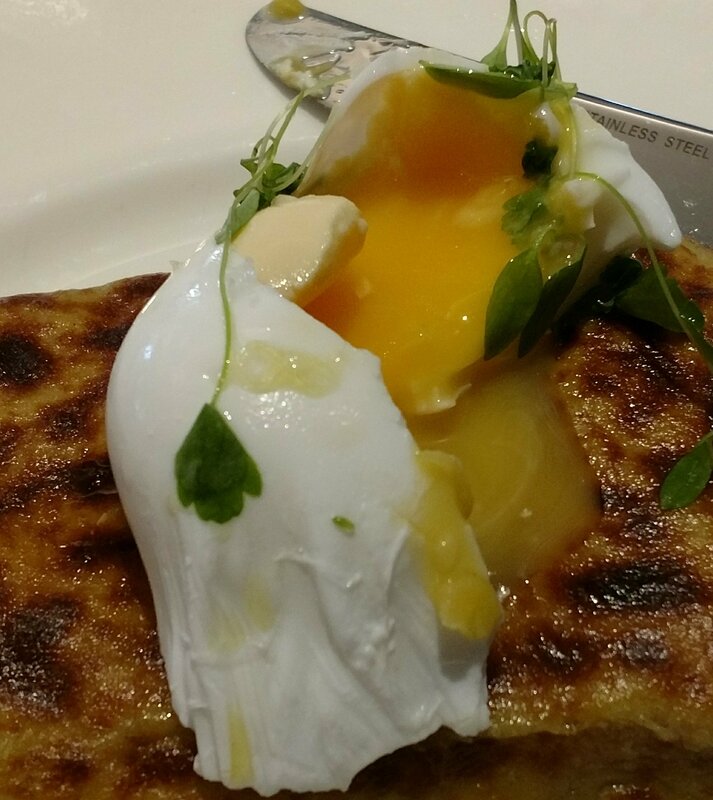 Whilst tempted by the tartare of salmon à la Américaine, I am a sucker for a good Welsh rarebit and a runny poached egg (always a good gauge of a kitchen that – if they bugger up a poached egg up then there really is no hope) so plumped for that. When it arrived it did look a bit lonely on its white plate. I am not one for unnecessary garnish, but a small side salad with a decent vinaigrette would have been welcome both visually and on the taste front (to counter the richness of the rarebit and egg). 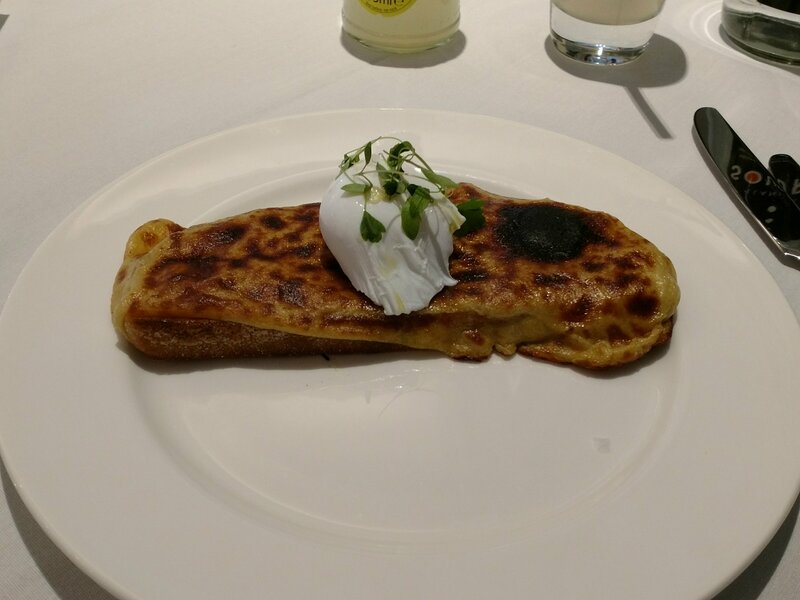 The rarebit itself was nice, with a pleasing piquancy to it which came from liberal use of mustard and a proper mature cheddar. It sat on some decent sourdough bread. It all could, however, have been a tad warmer. The hen’s egg (like to see a cockerel’s one!) was suitably runny, although by the look of it had only just been caught in time. I was there with one of the usual bunch of work reprobates I often lunch with, who wanted to recce the place as he had received a £75 voucher for it as a present. He went for salt roasted beetroot and goats cheese salad for starter. He pronounced this a enjoyable rather than perhaps memorable. Decent Kidderton Ash goats cheese used here and a nice dressing, which complimented the well flavoured salt baked beetroot. 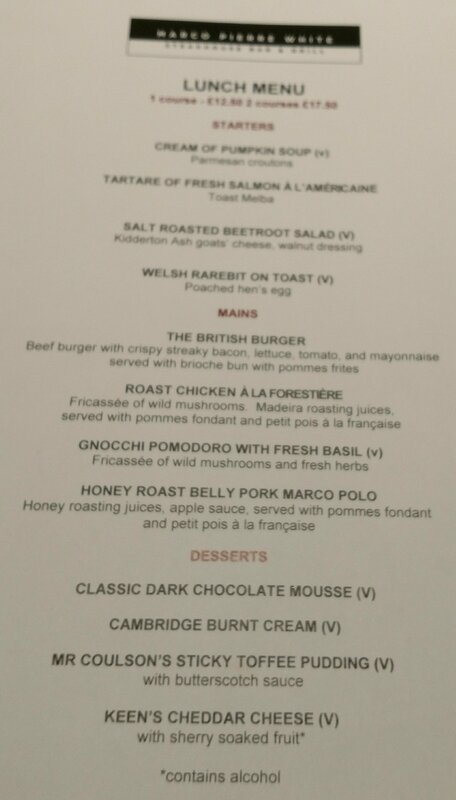 On to the mains, I decided on the roast chicken a la forestière (just shading the honey roast belly pork Marco Polo), having discounted the burger and the gnocchi as a touch tame sounding. 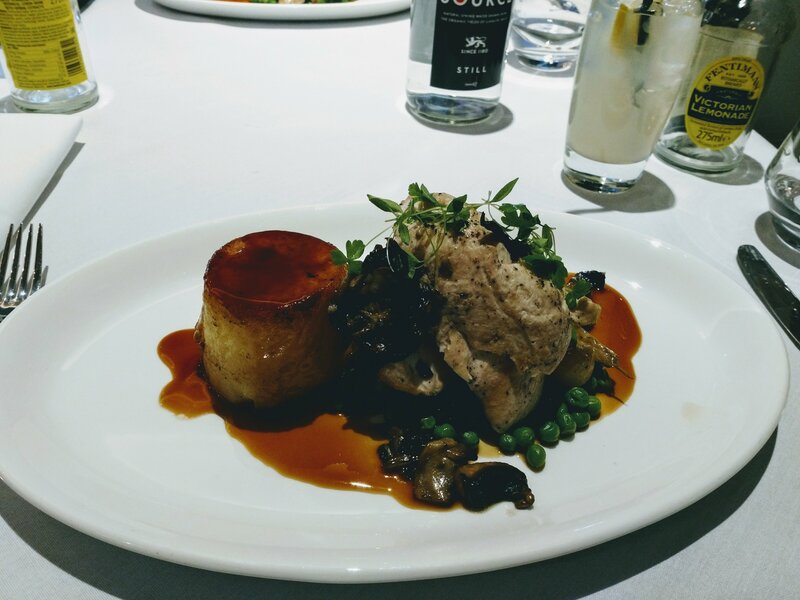 I enjoyed this dish, with the succulent chicken having a good favour and the mushrooms and maderia wine sauce added a good umami hit and a hint of sweetness. I also like the acidity of the silver skin onions that came with the not over cooked peas. Couple of issues though, with the chicken skin a bit flabby rather than crisp (which was strange when it was roasted, with salty crisp skin one of the absolute joys of a piece of roasted chicken) The fondant potato also wasn’t as buttery as I would have liked and, oddly, slightly watery on the inside. My fellow diner’s initial main course choice was the pork belly, but he was then (after the placing of our order) told that that choice was off the menu (thus reducing the mains on offer from 4 to 3). His views regarding the chicken (good, but not flawless) mirrored mine. We skipped the desserts as we were full enough. All sounded pleasant, in a homely sort of way. I like the idea of sherry soaked fruit with the cheese. We weren’t on the booze (work day lunch), but pre visit I had checked out the wine list. Decent enough selection, from around the world, with house wine selections from a good producer, in the form of Jean Luc Colombo. Prices are surprisingly not that hideous, if you pick wisely, with the cheapest wine (admittedly a pretty bog standard pinot grigio rosé, which retails at the £9 mark) coming in at £19.50, a Western Cape cabernet sauvignon blend (the Nederburg) on the list at £22.00 (retails at just under £12) and a Rioja Reserva Viña Real (no indication of year – assume was a 2013) going at £41 a bottle (£19.30 at Tanners for the 2013). Tread carefully when choosing off this list though, as the NZ Vidal reserve pinot noir is on the list at £38 (it retails for just £12.61) and the Lebanese Musar Jeune retails at well under a tenner and is an eye watering £39.50 on the list. Odd that the pricing is so scatter gun (with some mark up very reasonable, but others looking a bit gougey). 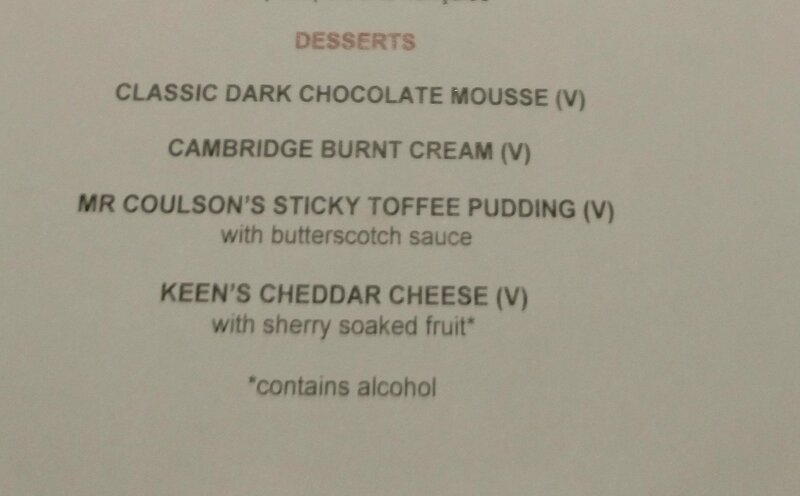 Bit disappointing that the list doesn’t appear to have even one sherry on it (they have clearly heard of it as use it in the kitchen, so why none on the wine list). Poor form that. I know I bang on about it, but sherry is such a good food wine. I think here an amontillado would have worked rather well with both the rarebit and the roast chicken a la forestière. Based on what was actually on the list, if drinking booze, I would probably have gone for the Beaujolais – Village from Pascal Clement on the list (£26, retails at just under a tenner) with the food I ordered. Soft drinks are very pricey, with both Fentimans and Frankin & Sons drinks (250ml) priced at £3.20 and bog standard (330ml) sodas a whopping £3 a pop (Tescos do 8 x 330 ml cans for £3). That is some mark up and a bit (actually alot) of a rip off if you ask me (and there’s me thinking the level of mark ups on wine is bad). Hardly an encouragement for any poor designated drivers!! We had still water (£3 – we neglected to ask for tap and it was not offered) and two Fentimans Victorian lemonades (£3.20) These adding nigh on a tenner to the bill. The bill for two, two course lunches and soft drinks turned into a not so cheap just shy of £50. 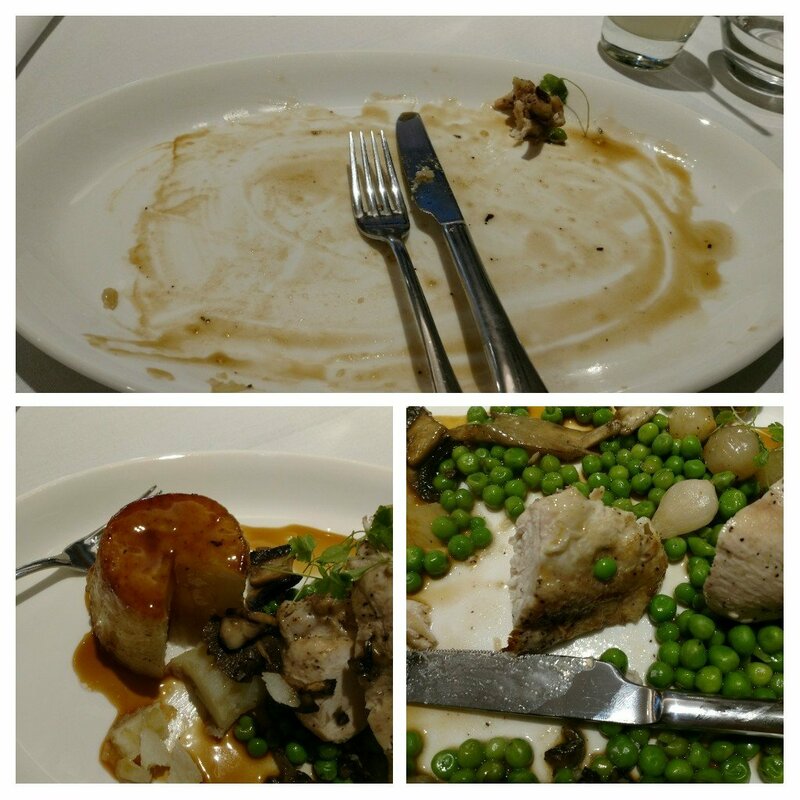 In reality, for lunch, one (main) course was probably enough. 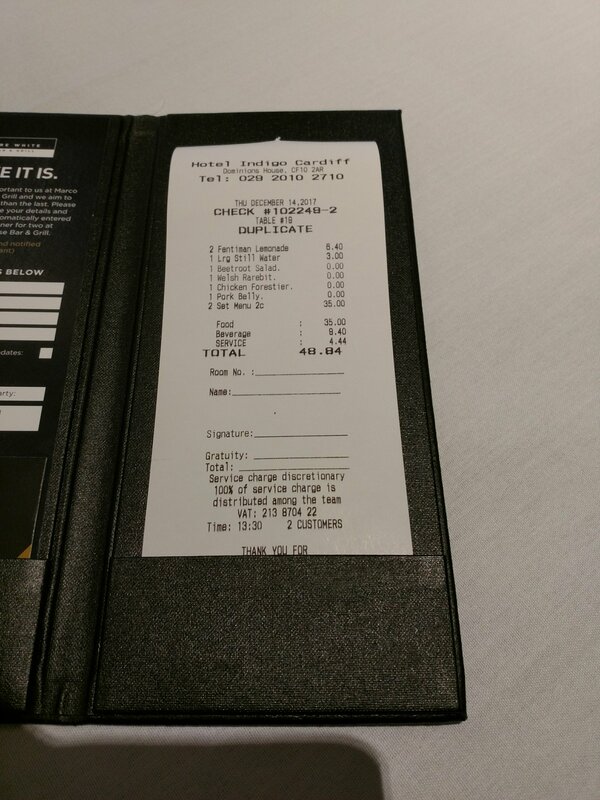 A service charge, irritatingly, had been automatically added to the bill – a practice I don’t like at all, especially where (as was the case here) there is a further request for a tip on the bill (can’t have it both ways in my opinion). Just leave it to the customer please. The food was nice rather than exceptional. In terms of Marco’s out of 10, I would give it a 6.5. Would I go back? Hmmm – probably, but can’t say I have any burning desire to visit again anytime soon. Decent enough for lunch, but better fixed price lunch offers are already available in Cardiff in my opinion. 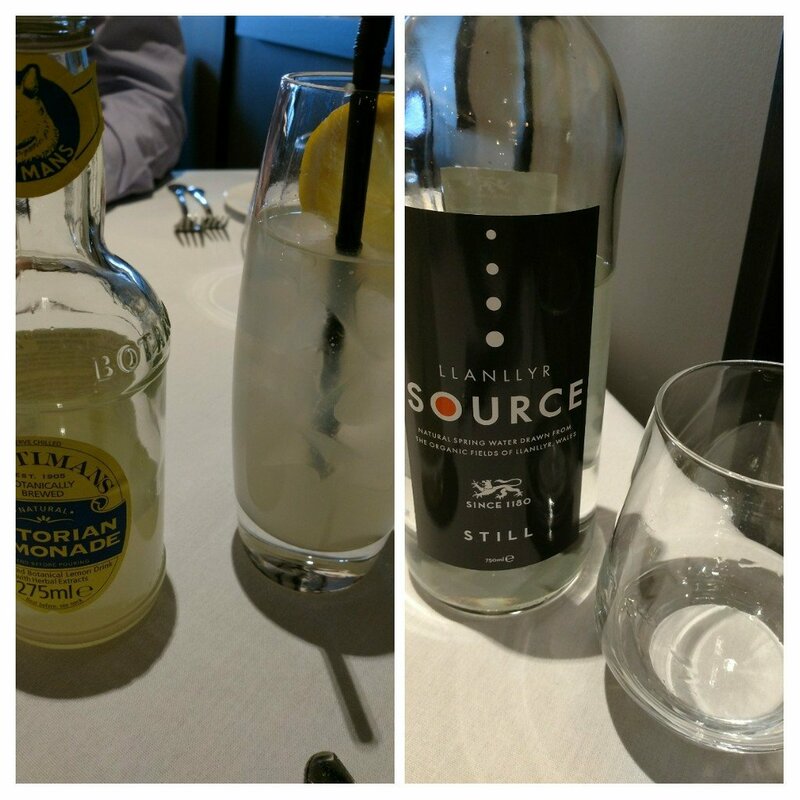 This entry was posted on Dec 17, 2017 by solicitingflavours in Alcoholic drink, Asador 44, beef, Burger, burgers, Cardiff, Cardiff restaurant, chicken, cocktails, Drink, Dry white wine, English Wine, Fixed Price Menu, Food, Food and wine products, France, French wine, lamb, Lunch, lunchtime, Marco Pierre White, New restaurant Cardiff, Non alcoholic drink, Pie, Pies, Red Wine, restaurant review, review, Rioja, salad, steak, Steak house, Uncategorized, vegetarian food, Wales, welsh rarebit, White wine, Wine, wine mark up.